New Pontificate, new "non-negotiables". If for Benedict XVI, non-negotiable items were clearer and more definable, for the new Secretary of the Congregation for Religious, there is above all one point, what appears to have been the only relevant Catholic event in the history of the universe. José Rodríguez Carballo mentioned as an important point of religious life fidelity to Vatican II: "For the consecrated, the Council is a point that cannot be negotiated." And he affirmed that those who search into the reforms of Vatican II all the ailments of religious life "deny the presence of the Holy Spirit in the Church." 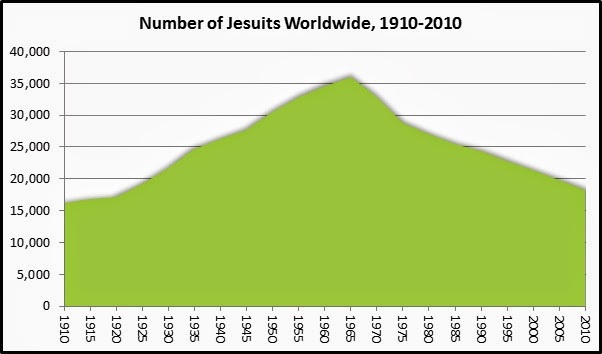 It is clear who is living outside of history - the anachronistic people running the Congregation for Religious stuck with false solutions thought for the reality of the 1960s that, when "faithfully" implemented, led to the near collapse of almost all consecrated life, and the corruption of most religious life that remained almost to the point of non-recognition. This tragic reality is acknowledged, but no amount of cognitive dissonance prevents the super-dogmatization of Vatican II. The latest Council as "super-dogma": how long and strongly did Joseph Ratzinger fight to get rid of this notion! How strongly the Franciscans of the Immaculate (certainly one, probably the main, institute Rodriguez Carballo had in mind in his words) tried to help Benedict XVI in the search for a way of continuity out of this crisis of legitimacy that the understanding of Vatican II as the one essential religious event in the history of Catholicism has fostered. It is as if we were in the 1970s all over again and no lessons had been learned. What is facetiously said (the origin is uncertain) of a certain dynastic house, that "they never learn, and they never forget": that seems to be the only way to explain the obsession of the "Spirit of Vatican II exclusivists". As diehard Marxists who watched the collapse the Soviet Empire, after decades of suffering and bloodshed supported by them and their fellow travelers, their only explanation is not that maybe there is something wrong with Marxism, but that it was not "rightly implemented": time to try it all more faithfully once again. "Spirit of Vatican II exclusivism" would just be embarrassing, were it not filled with real-life consequences. We now see clearly that the Pontificate of Benedict XVI was not the beginning of something, but merely a brief stop in the oasis in the middle of the desert: a respite for ourselves and our camels. Miserere nobis, Domine!